Creating beautiful, delicately ruffled and realistic carnations is easy to do with the Large Camelia Carnation Cling Stamp Set. When paired with the coordinating dies, these perfectly detailed petal and foliage illustrations layer together to create gentle, dimensional, and full carnation blossoms. The exquisite carnation with bud illustration makes a wonderful main focal point image to color and use on cards or scrapbook layouts and also provides the perfect base for layering a dimensional carnation embellishment. 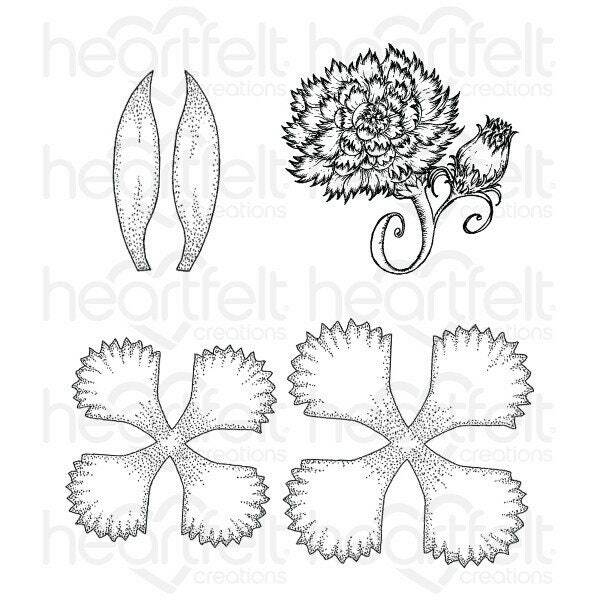 This cling stamp set is part of the Camelia Carnation Collection and pairs with the Large Camelia Carnation Die.This stamp and die combination has been created for use with the Floral Basics Shaping Mold as well as the Deluxe Flower Shaping Kit.